The United States Minor Outlying Islands are eight island territories of the United States. They are Baker Island, Howland Island, Jarvis Island, Johnston Atoll, Kingman Reef, Midway Atoll, Palmyra Atoll and Wake Island in the Pacific Ocean; and Navassa Island in the Caribbean Sea. The islands are grouped together for statistical reasons. They are not administered together. As of 2008, none of the islands have any people living there permanently. The only human population consists of temporarily stationed scientific and military personnel. The 2000 census counted 315 people on Johnston Atoll and 1 person on Wake Island. There has been no modern indigenous population, except at the 1940 census. In 1936, a colonization scheme began to settle Americans on Baker, Howland and Jarvis, but all three islands were evacuated in 1942 because of World War II. The islands are all together represented by the ISO 3166-1 alpha-2 code UM. The ISO introduced the term "United States Minor Outlying Islands" in 1986. 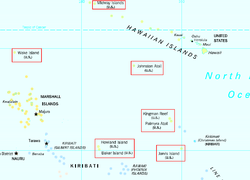 From 1974 until 1986, five of the islands (Baker Island, Howland Island, Jarvis Island, Palmyra Atoll and Kingman Reef) were grouped under the term "United States Miscellaneous Pacific Islands", with ISO 3166 code PU. The code of Midway Atoll was MI, the code of Johnston Atoll was JT, and the code of Wake Island was WK. The Pacific islands are surrounded by large Exclusive Economic Zones. Baker Island, Howland Island and Jarvis Island have a small boat landing place on each. Kingman Reef and Navassa Island have offshore anchorage only. B Previously claimed by Hawaii when independent. Palmyra was officially part of Hawaii until 1959. D These islands are controlled by Colombia, and are not included in the ISO list of territories. Their areas are not included in the totals. ↑ 2.0 2.1 2.2 "Office of Insular Affairs: Baker and Howland Islands - History". United States Department of the Interior. Retrieved 2011-06-10. ↑ 3.0 3.1 "Office of Insular Affairs: Jarvis Island - History". United States Department of the Interior. Retrieved 2011-06-10. ↑ "NGA.mil". National Geospatial-Intelligence Agency. Archived from the original on 2 December 2008. ↑ "Presidential Proclamation 8336" (PDF). Retrieved 2011-06-10. ↑ "Weekly Compilation of Presidential Documents: Monday, January 12, 2009 Volume 45—Number 1, Page 14" (PDF). United States Government Printing Office. Retrieved 2011-06-10. ↑ "Office of Insular Affairs: Johnston Island - History". United States Department of the Interior. Retrieved 2011-06-10. ↑ "Executive Order 13022: Administration of the Midway Islands". United States Fish and Wildlife Service. Retrieved 2011-06-10. ↑ "Department of the Interior: Secretary's Order #3223". United States Department of the Interior. Retrieved 2011-06-10. ↑ "Department of the Interior: Secretary's Order #3224". United States Department of the Interior. Retrieved 2011-06-10. ↑ "Department of the Interior: Secretary's Order #3210". United States Department of the Interior. Retrieved 2011-06-10. This page was last changed on 15 March 2019, at 22:44.